These lyrics are from the McFly song Transylvania. I’ve always loved this song (not because of these lyrics), but when I was at Wembley Arena yesterday, it struck me as odd that Anne Boleyn is mentioned at all. Most bands pick more significant characters to mention in their song, especially portrayed in an almost romantic light. 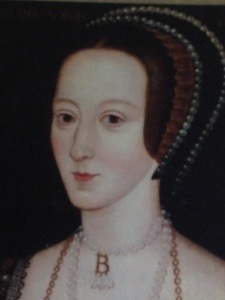 Anne Boleyn died 467 years ago today, executed in London after being found guilty of the charges laid against her. Yet she still remains a popular figure, popping up in songs, plays and TV programmes. What is it about her? I featured in a documentary about Anne Boleyn last year, along with several other girls who felt a strong sense of admiration for this young woman. Strange perhaps that we admire a woman who was labelled an adulteress, a witch, a whore and countless other things. It’s still a man’s world out there and women still struggle for power as men continue to dominate. Anne rose from almost nothing to become queen of England, one of the most influential people at the Royal Court. Her position benefited her family and friends, enhancing their wealth and status at court. She was also a significant player in England’s break with Rome and movement towards a Church of England and Protestantism. She shaped the future of our country and gave birth to one of the strongest rulers in British history. Anne was a woman. We’re all headstrong, passionate and determined. The world’s changed a lot, but men still seem to resent powerful women. I know that men often find me a bit too much to take, especially when I’m constantly busy, doing this and that, with no time for them. Yet, I still expect to get my own way and want them to be around when I want them. Maybe Anne is still present in modern day because she is the epitome of what women want to be-beautiful and powerful. Personally, I don’t see anything wrong with that, and if that means I would have lost my head, almost for just being female, then at least that’s something I don’t have to worry about nowadays!